CM: This rare image of Erotes Trygontas Stafylia (Putti Harvesting Grapes) is one of few seals created by Michael Lekakis. The iconography of putti harvesting grapes is unique in its historical evolution. 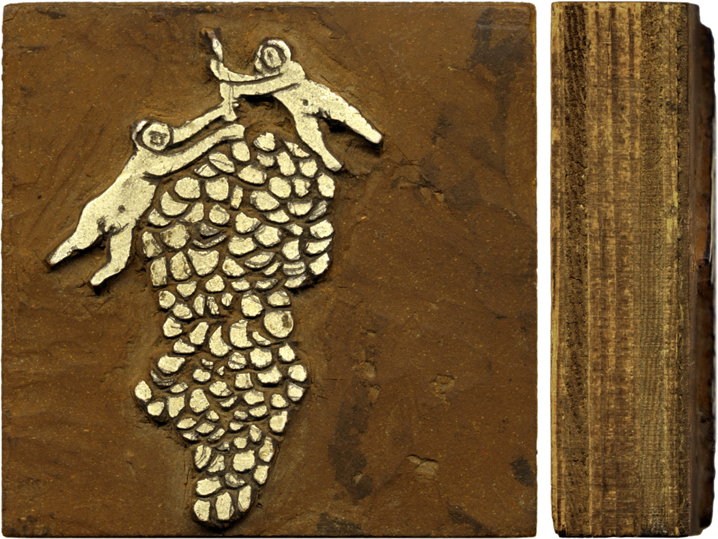 Putti and grapes have ancient value as symbols of the god of wine, Dionysus (Bacchus). Early Christians adapted the theme as a representation of the Eucharist. This is one of the very few instances of Christianity assimilating a pagan visual symbol. The most notable example of the early use of putti harvesting grapes in Christian iconography is in Santa Costanza in Rome. Putti again became extremely popular decorative devices in the Baroque period. This seal is an exceptional example of the theme, having a couple of juxtaposed disporting putti holding onto the grapes' stem. The hovering body of each putto echoes the grapes' silhouette.